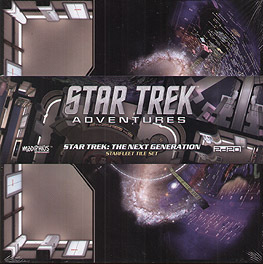 Fight alien incursions through Starfleet corridors and shut down a warp core breach while dodging disruptor fire. These Star Trek Adventures geomorphic gaming tiles are based on set designs of Star Trek: The Next Generation with development by Rick Sternbach (Star Trek: The Next Generation Technical Manual) and designed by Jose Esteras. From main engineering to the bridge of a Galaxy-class vessel, Star Trek: The Next Generation Starfleet Tile Set beams you straight to the action! Designed for use with Star Trek Adventures 32 mm scale miniatures.